« Did the universe just get less weird? In music, there is a chord known as the “Jimi Hendrix chord”. For those who know about these things, it’s a dominant 7 #9 chord – e.g. C7#9 contains the notes C E G Bb D#. The dissonance between the E and the D# (the major and minor third in C respectively) creates the gritty, edgy, crunchy rock sound that Hendrix uses in Foxy Lady and Purple Haze. There is a story, possibly an urban legend, that Purple Haze is so named because the Jimi Hendrix chord in its introduction made Hendrix see a purple haze. Other theories invoke copious amounts of LSD and marijuana, but it is the triggering of a purple haze that I want to focus on. This phenomenon, of one sensory experience involuntarily triggering a second, usually unrelated sensory experience, is known as synesthesia. It is a neurological condition, and appears in a variety of forms. For example, some synesthetes (as they are called) associate letters and numbers with colours – for example, a black 5 written on a page is seen to be green; a 2 seen to be red. First, the word “sunset” connects with the concept of a sunset. Next, the concept of a sunset connects with a mental picture of a sunset. Finally, the mental picture of the sunset fills the mind with an orange-red glow. The mind does all this in an instant, so that the word “sunset” and the colour “orange-red” link seamlessly. We might postulate that synesthesia involves the same sort of connections, albeit a bit less obvious. For example, the number 2 could trigger a childhood memory of a refrigerator magnet ‘2’ that happened to be red. As time goes by, the connection between the number 2 and the colour red remains even when the fridge magnet is forgotten. But synesthesia is more than simply association – the number 2 doesn’t just remind them of the colour red. When synesthetes see a black 2, they will tell you that it “really is red”. But is there any way to test how real this mental response is? Subjects were asked to identify the hidden shape. 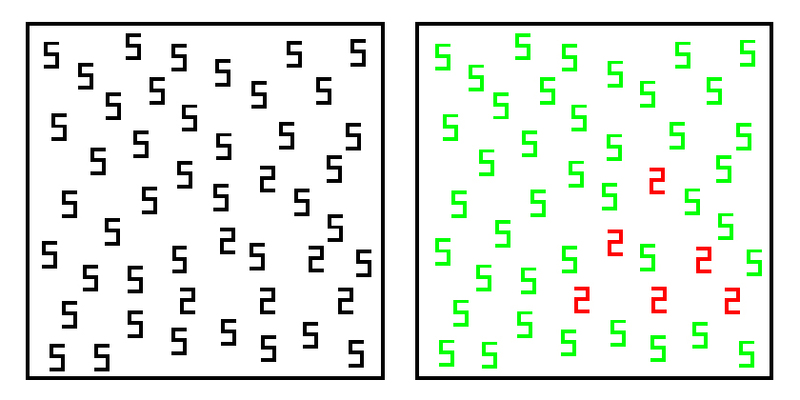 If recognising the number triggered a concept that triggered a colour, then the colours wouldn’t appear until after the number was recognised. Thus, if synesthesia is just a subjective, mental connection, then it won’t help a synesthete to find the hidden 2’s. The results were astounding. Non-synesthetes took about 20 seconds to find the shape; synesthetes took about a second. How do you explain that? Seeing something that isn’t there is one thing, but having it improve your ability to discern shapes is something else. Its like having an imaginary friend who actually helps with the laundry. (This is why synesthesia isn’t usually classified as a neurological condition, because it is often advantageous to the “sufferer”.) Most explanations involve rejecting the linear processing of sense data we invoked previously. Some researchers have suggested that increased cross-talk between different regions of the brain that are specialized for different functions could explain it. What if you could train your mind to use synesthesia? What if a piano student who struggles to read music could be taught to see each note on the page as a different colour? Could children be taught to see harmful objects as red and harmless ones as blue? What if you saw interesting blog posts as red, and boring ones as blue? That’s really interesting. I’m pretty sure my own non-synesthetic number-colour associations are due to childhood fridge magnets. The Jimi Hendrix chord appears in a few Steely Dan songs too. But they’re more known for the Steely Dan chord, which is a major add 9th with the 9th/2nd in the bass. For example, D/E. Different chords. D/E is the equivalent of E7,with a natural 5. The Jimi chord is voiced E G# D Fx (f double sharp aka g natural.) There is no 5th. You’ve just given me a great idea to help my learn guitar chords. Greetings, sudden rush of people from Reddit. I’d curious if hallucinogens that Jimi Hendrix was notoriously known for would have any effect on this condition. I’m unsure if the two are connected, but the idea of “seeing music” would be an interesting way that (Jimi) created his unique perspective on music. Getting as many quotes as possible and begin taking care of your oral health today. Ted Nugent is famous for his anti-drug and anti-alcohol stance and I recall him talking in an interview about his early interactions with Jimi Hendrix. Jimi was telling him she should try LSD, saying “you will be able to play with SO many more colors”. Of course, it wasn’t until many years passed that the comment changed from the idea that Jimi was just a whacked out druggie to the idea that he may have suffered (or benefited) from Synesthesia, specifically Chromesthesia. To him, the notes weren’t simply sounds but an actual flowing painting of colors and they flowed like they did because you could never put certain colors in certain sequences because it would make a horrible vision. Having read and watched quite a bit about Jimi I fully believe Jimi “saw” sound as color. He would describe vivid dreams of all sorts of beautiful colors and his goal in playing the music he played was to recreate those dreams live in his mind using the guitar as his brush and canvas. He “suffered” with synesthesia and we all benefitted.